I didn’t have much of an agenda, but I was shopping around for decent copy of Fantastic Four Vol 1 #48 (first appearance of Silver Surfer/Galactus) and found several copies ranging from $75-$350. While I was ready to pull the trigger on a couple of them, I was disappointed to find out most of the vendors with the high price books wanted cash only. (Seriously?) Note to all trade show vendors… Cash is out and plastic is in. I’m not bringing a wade of cash into a two day comic show that I’m only staying a few hours for. (Get with the times) Outside of that minor disappointment it was a pretty impressive small show. For $15 admission ($10 in advance, kids < 13 free) I had access to 36 comic vendors, 7 toy vendors, 2 non-sport card vendors and small host of indie creators & some professionals, including George Perez & a panel of Swamp Thing Creators (Stephen Bissette, Thomas Yeates, John Totleben & Richard Veitch). The expo had all the other traditional con amenities, a costume contest, a few panels, VIP tickets, Roller Derby girls & a kids contest with scavenger hunts and prizes. While we (me and the boys) didn’t participate in most of the available activities, we did enjoy the Ohio, Kentucky, Indiana Lego User Group scavenger hunt and for the boys the best part was checking out The Gotham Super Car, a 1960’s Adam West Batman throw back car. 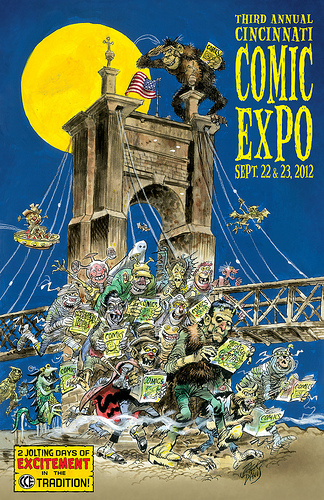 This was my first year being able to attend the Cinci Comic Expo, now in its third year. I’d have to say that I’m pretty pleased. If I was on my own I would have thoroughly enjoyed flipping through thousands of back-issues and working out deals on some silver age gold. Just a year ago this con was a single day event. This year the con graduated to 2 full days for the general public (Sat/Sun), plus a third day (Friday) for VIPs that wanted to attend a ‘Geek Prom’ & ‘Geek Speed Dating’. This is a pretty big deal for a con that in it’s previous two years, was only a single day event. I certainly hope it’s success continues and we see at least a 2 day con next year. Until Next Time... I encourage everyone to try out the small cons & shows. Cincinnati had an excellent sized show for comic collectors to spend half a day or two, flipping through back-issues without the hubbub of gigantic autograph hound crowds. conventionscene.com keeps a fairly up-to-date shared Google Calendar of all comic con events. I encourage you to go out and find the one’s closet to you and support the growing comic community.